'A Message To Moscow': Jailed Hunger Striker Wins Human Rights Award The winner of the Sakharov Prize is Ukrainian film director turned activist Oleg Sentsov who is serving a lengthy prison sentence in Russia, accused of plotting to bomb sites in Crimea. 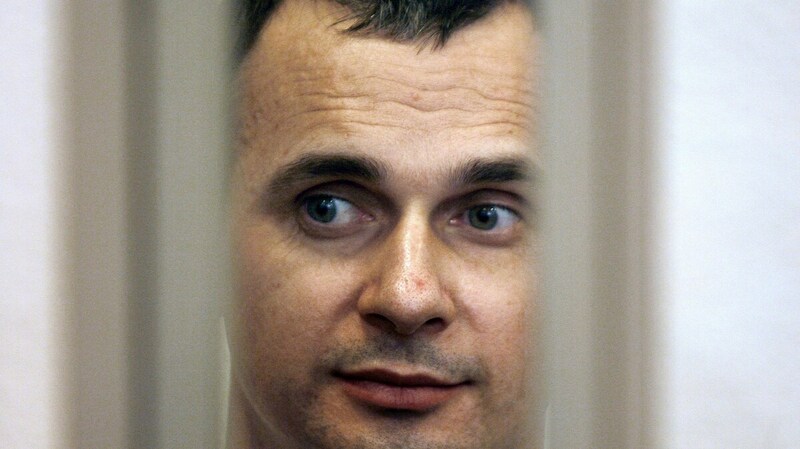 Ukrainian film director Oleg Sentsov is seen inside of the defendant's cage in a military courtroom on July 27, 2015. He is currently serving a 20-year sentence. An imprisoned Ukrainian filmmaker, who recently ended a 144-day hunger strike, won the Sakharov Prize for Freedom of Thought, awarded by the European Parliament. Oleg Sentsov became a symbol of political prisoners worldwide when he went on the hunger strike, demanding freedom for dozens of Ukrainians jailed by Russia, Teri Schultz reported for NPR. European Parliament President Antonio Tajani said Sentsov's award is a message to Moscow. Sentsov was arrested in Crimea shortly after it was annexed by Russia in 2014. He's serving a 20-year sentence in a Russian prison. NPR's Corey Flintoff reported that Sentsov was accused of plotting to blow up buildings, utilities and monuments in the Crimean cities of Simferopol, Yalta and Sevastopol. Sentsov rejected the charges against him, which the European Parliament said were handed down because "he opposed the illegal and forced annexation." "By awarding him the Sakharov Prize, the European Parliament is expressing its solidarity with him and his cause. We ask that he be released immediately. His struggle reminds us that it is our duty to defend human rights everywhere in the world and in all circumstances," Tajani said said while announcing this year's winner on Thursday. Previous winners of the human rights award include the co-recipient of 2018's Nobel Peace Prize Denis Mukwege and previous Peace Prize winners Nelson Mandela, Aung San Suu Kyi and Malala Yousafzai. The award named after the late Soviet nuclear physicist and dissident Andrei Sakharov consists of a certificate and the equivalent of about $56,000. This is the 30th year it has been awarded and, according to the European Parliament, goes to individuals and organizations defending human rights and fundamental freedoms. Sentsov was among three finalists for the award, which included another man serving a 20-year prison sentence for political dissent. Last year the prize was awarded to political prisoners in Venezuela in combination with that country's democratically elected national assembly, which was stripped of power in 2017. Sentsov's award will be given out in Strasbourg, France, on Dec. 12.